Enter your email address to receive a weekly newsletter about the newest places, hottest news, and coolest anything! 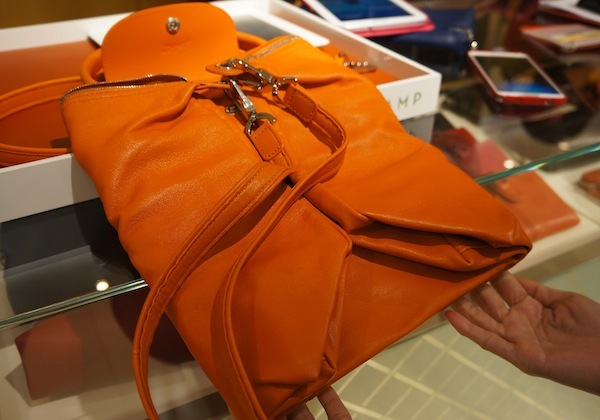 Longchamp celebrates the 20th anniversary of its iconic Le Pilage bag this year and, as a treat for its die-hard fans, the brand is marking it by allowing you to personalize your own Le Pilage Cuir. 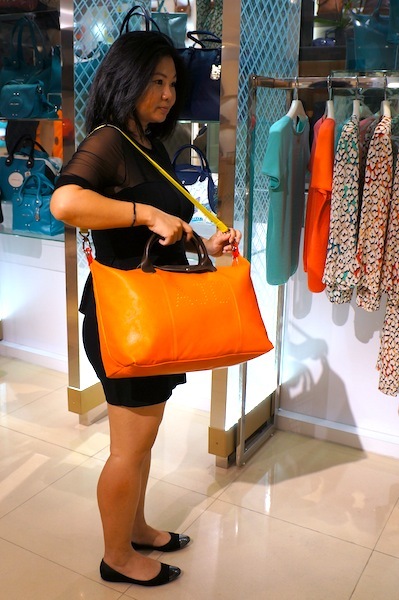 Deborah Tan gets her own Le Pilage Cuir in this story. 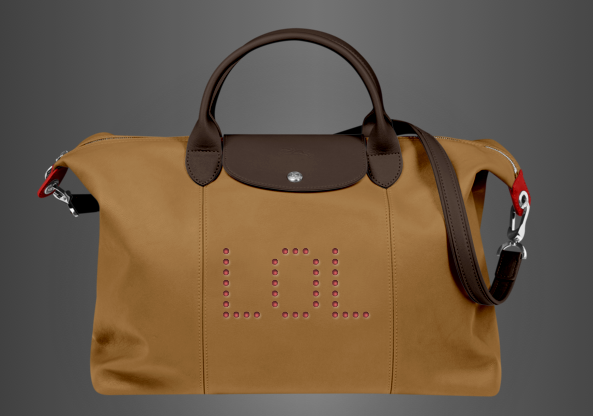 Admittedly, I’m not a fan of Longchamp’s Le Pilage nylon bags. But when I was introduced to the Le Pilage Cuir, my heart warmed just a tad bit towards the world-famous foldable bag. And when Denise returned from her holiday in Belgium with a brand new Longchamp Planetes (a bag inspired by the Le Pilage), I was officially flirting with the idea of putting money down for a Longchamp tote. The Le Pilage Cuir – although made of leather – is foldable, just like its nylon sister. Made from a specially crafted leather that is soft, supple, yet strong, the Le Pilage Cuir retains the bag’s iconic foldability without cracking. You can fold the Le Pilage Cuir just like how you would with the Le Pilage nylon. This invitation to personalize my own Le Pilage Cuir couldn’t have come at a better time. For this, I made my way to the Longchamp boutique at Paragon. First, you choose the size. Although the personalization service is available for a clutch, to truly get a bag that’s uniquely yours, I recommend you go with a proper Le Pilage bag. I’m looking for a bag that I can use as a work-bag when I travel so, it’s gotta fit my laptop, charger, phone, notebook, Kindle and a multitude of stationery and chargers. The Medium, which measures 32cm by 28cm by 17cm, is a bit too small. I decided to go BIG (40cm by 31cm by 18cm)! This is the Le Pilage Cuir in Big. Next, it’s to the shop’s iPad to personalize my bag. You get up to 8 colors to choose from for every part of the bag (with the exception of the lining) – how’s that for choice! Every part of the bag can be personalized – body, handle and flap, shoulder strap, tabs, and the inner lining. You even can put your initials on the bag to mark it as yours. You can pick a color for every component of the bag. Red, blue and yellow – AC colors! In the end, I came up with 3 combinations I really liked. As much as I wanted to create a bag that reeks of my individuality and creativity, I decided it still has to be a bag that I would want to carry every day and one that wouldn’t look too out of place with my wardrobe of black dresses. Can you guess which one I went for in the end? Which one did I pick? What Vanessa’s bag might say … haha! 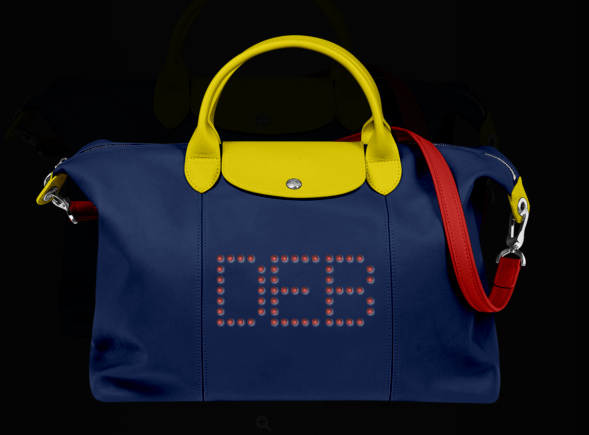 The Le Pilage Cuir Personalized is exclusively available at Longchamp’s Paragon boutique. Deborah was invited to experience the service for review purposes. All opinions are her own. The post was neither paid for nor advised by Longchamp. About The Author: Deborah Tan is a founder of Material World. After 10 years of working in magazines Cleo and Cosmopolitan Singapore, she is now a freelance writer/editor who works on this website full-time. She likes liquid eyeliners, bright red lipsticks, tattoos, rock & roll, Mad Men, and Suits. She hopes her bag will be ready by the time she heads to Japan for a work trip! Follow her on Twitter @DebTanTweets. It’s no April Fool’s joke – there really ARE that many things to check out, try and buy this month! Bring it on, we say. Spuds & Apron – a new dining spot on Mount Faber – is offering an all-you-can-eat Easter Buffet on 20 April 2014. Tuck into a sumptuous spread of sashimi, seafood, roast and hot-cross buns, and more for just $55++ per adult and $18++ per child aged 3 to 12. Make your reservation at 6377 9688 or customerservice@mountfaber.com.sg. Come April, partying on a yacht won’t just be the privilege of the rich and famous. Belvedere Vodka has partnered with AOS Collective and Sunshine Nation – the people behind the successful yacht party travel series – to organise this awesome event, which is set to take place April 26, 2014. 10 yachts will set sail from One°15 Marina Club at Sentosa Cove and will drop their anchors at Lazarus Island so revellers can party the night away. Tickets are at $175 per person, inclusive of two complimentary Belvedere Vodka cocktails, available at http://www.boatsandbeats.com. Did you know that half of the Singapore population eat their meals at hawker centres/food courts/coffeeshops at least six times a week? According to a spokesperson from multivitamin brand Centrum, an unbalanced diet can result in chronic health conditions such as osteoporosis, birth defects and anemia due to a deficit in certain nutrients. This is why multivitamins are recommended since they cover a wide range of vitamins. Scientifically formulated to meet women’s nutritional needs, Centrum for Women helps ensure you receive the right nutrition, giving you benefits like healthy hair, skin and nails, as well as improved immunity and bone health. 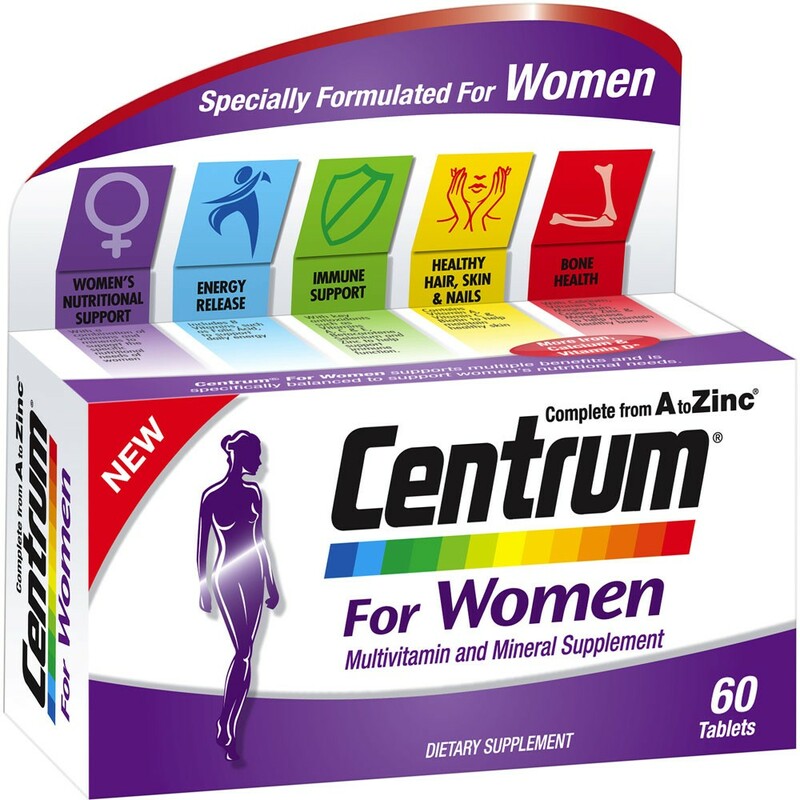 Centrum for Women, $42 for a bottle of 60 tablets, is available at major health and personal care pharmacies. WANTED: We need you to spare 5 minutes to take this survey on health supplements! Click here and do help ask your male friends to join in too! How much do we love this new zi char restaurant in the East? Let’s just say that we were initially quite reluctant to share it as it’s already packing in the crowds as it is. The seafood here is the freshest and most well-prepared we’ve had in awhile; standout items include the sinfully irresistable Salted Egg Sotong, and the Gan Xiang Crab. 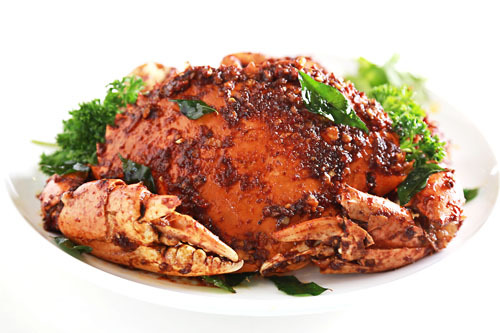 We love how the “gan xiang” spices did well to enhance the crab’s sweetness without overpowering it. It’s comfort food at its best, with prices that won’t break the bank. If there’s one good thing about living so near the Equator, it’s getting to wear pretty swimwear all year round. Homegrown label Mileti has recently launched their latest collection, Elba, which is a vibrant mix of pastel colours, vivid hues, and loud, shiny prints. Anyone up for a pool party? Mileti swimwear is available online at www.miletiswimwear.com. Fine Wagyu beef, paired with fine whisky? Why didn’t someone think of this sooner? This dream food pairing is now available via a four-course meal at Fat Cow, available exclusively during the month of April. The Macallan 15 years will bring out the delicate flavours of chopped maguro over sushi rice, while the Macallan 18 years will enhance the smokiness of charcoal-grilled Wagyu. Mmm … our mouths are watering just typing this. The Macallan Whisky Pairing dinner is priced at $138 and available at Fat Cow, #01-01 Camden Medical Centre. Whether or not you’re a fan of the Korean girl band, you can’t deny that the limited-edition watches in the collection are just. So. Pretty. 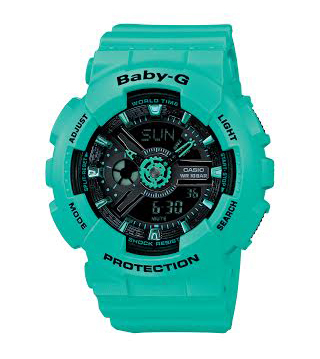 There are three in the BA-111GG for all avid Baby-G collectors – black, green, and orange. The watches in the BA-111GG collection are priced at $199 each and are available at all G-Factory outlets. 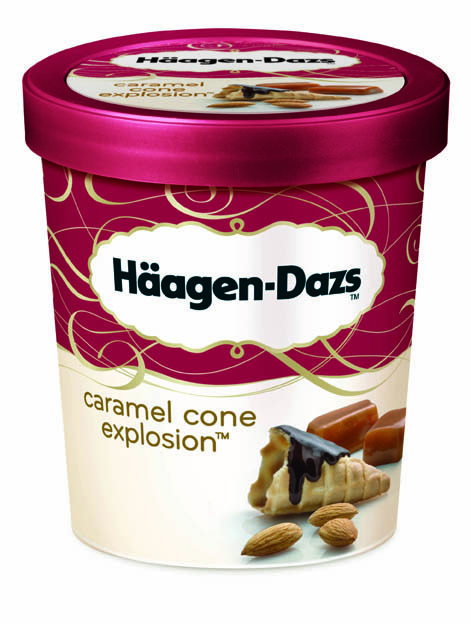 Haagen-Dazs introduces a brand new flavour this month – Caramel Cone Explosion! Ice cream fans will love the mix of creamy caramel ice cream, crunchy caramelised almonds, chocolate-coated cone pieces and thick caramel swirls. Every spoonful is guaranteed to be sheer dessert paradise! Available at $14.50 per pint at all Haagen-Dazs outlets and major supermarkets. Yes, you read right. On Pedder is bringing in an entire range of footwear that feature butterfly heel detailings, blossoming flowers, and whimsical insect prints. Just in time for Spring, we say! This delightful collection is the brainchild of Sophia Webster of London, one of the hottest young designers in the fashion circuit today. For a full listings of On Pedder outlets, click here. Fashion mavens who live in the western part of Singapore, rejoice! From April 17 to May 4, Jem will be holding its inaugural Spring/Summer fashion event with weekly themed fashion displays around the mall, as well as a street parade curated by our very own “Godfather of Fashion” Daniel Boey. For more information on Jem’s fashion campaign, click here. 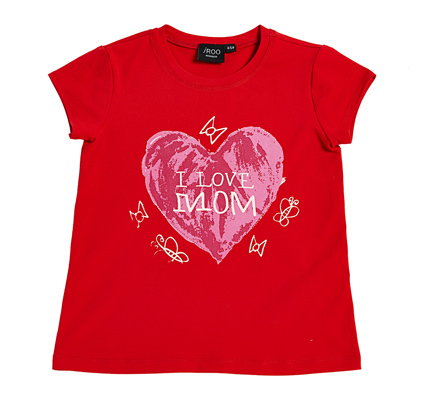 Just in time for Mother’s Day (May 11), iROO will be launching a limited-edition Kids Capsule Collection, which consists of specially designed apparel for girls from four to five years old. From a cute navy dress to preppy striped jackets, you’ll definitely find something for your little princess. The iROO Kids Capsule Collection, available from April 18 to May 11 at iROO boutiques islandwide, is available only as a gift with purchase with a minimum spending of $188. 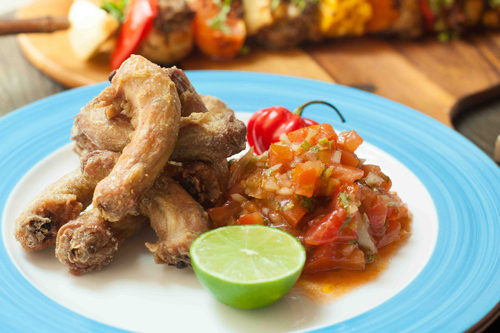 For an Easter feast with a twist, make your way to Lower East Side Tacqueria between Friday 18 and Sunday 20 April 2014. The Glorious Easter Feast, at $26 per person for a minimum of 4, features yummy dishes like the exotic Cuello de Pollo (fried chicken necks) and the buttery, cheesy chargrilled Elote (corn). The feast has a total of eight dishes, so go hungry! Lower East Side Tacqueria is located at 19 East Coast Road. Call 6348 1302 to make your reservations. Lipsticks just got more fun with Maybelline Color Show! This April, 20 ultra chic shades will be introduced into the Color Show family in a myriad of Reds, Pinks, Nudes and Plums. At $9.90 each, you can experiment with these trendy shades to your heart’s content! Get these lippies at selected Watsons, Guardian, SaSa and supermarkets now. Those spots you see on the wall after a few years? That’s fungus such as mould and mildew – no surprise, considering Singapore’s humid conditions. 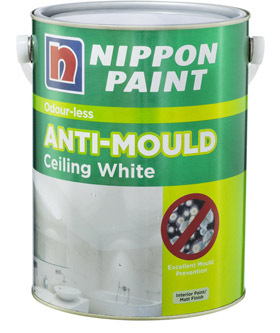 Combat that problem with Nippon Odour-less Anti-Mould Ceiling White. Offering excellent coverage, it can be applied to a variety of surfaces, such as cement, plastered walls, and fibre boards. For more information, visit www.nipponpaint.com.sg. So … ever forgot about a friend or loved one’s birthday till the very last minute? New online cheesecake shop Cat and the Fiddle (www.catandthefiddle.com) is on hand to save the day. 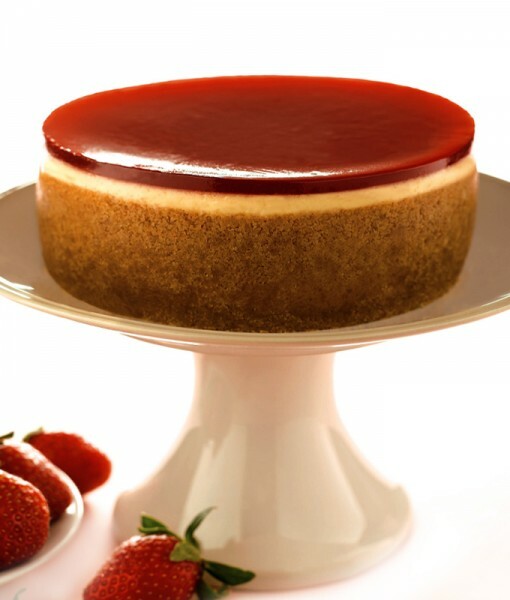 Offering 10 delectable selections from just $19.90, you can even personalise your cheesecake order and have it delivered the very next day. We haven’t tried the cakes ourselves, but so far, we’ve loving the quirky designs we’ve seen on the website. If you’re looking for delicate and super-feminine silver necklaces, you have to check out online store Amore Silver. 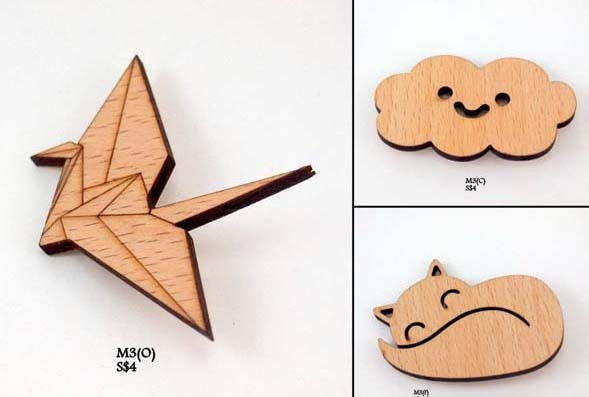 The pendants go from cute to intricate and, best of all, the prices are super friendly on the pocket. There is a 14 days no-questions-asked money-back guarantee so you can simply mail back the products for a full refund. But from what we are seeing, you have no need to. The pieces are made from 925 silver and are a breeze to match! 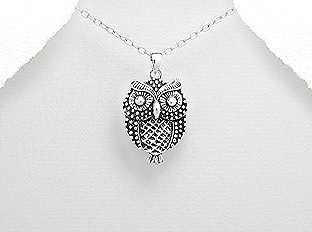 Check out Amore Silver’s delicate pendant necklaces at amoresilver.com now. 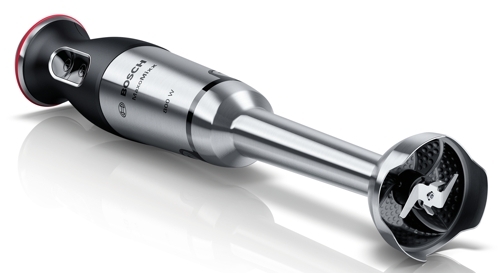 Cooking just took on a whole new dimension with the Bosch MaxoMixxo hand blender. This nifty kitchen tool comes with 12 speed settings, 750 watts of power and a four-winged Quattro blade stainless steel foot, which makes whisking, dicing, and chopping an absolute breeze! In line with their eco-friendly ethos, City Square Mall will be bringing you a series of nature-inspired animation films … all for FREE! 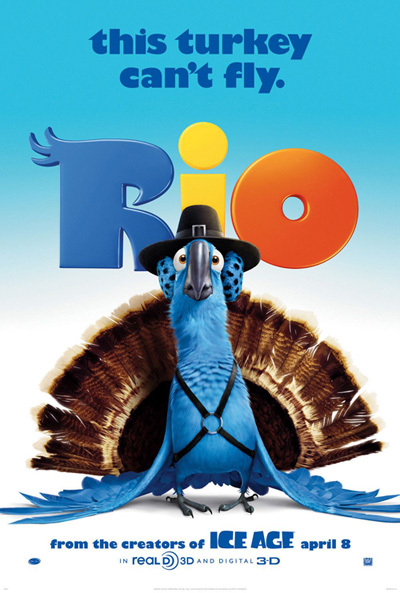 This three-part series kicks off with the family-favourite Rio on April 11, Friday. Perfect way to wind down after a long week at work, we reckon. City Square Mall Monthly Movie Madness will be screened at B1 Fountain Square. Oily skin going out of control in this hot, hot weather? 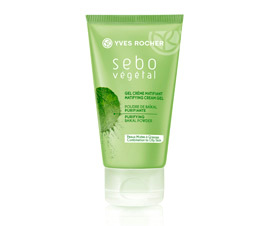 We are loving Yves Rocher’s Sebo Vegetal Mattifying Gel Cream, $24, and Pore Minimizing Serum, $30. The secret to this powerful shine-control range lies in the use of Baikal Powder – a purifier that restores freshness and mattness to the complexion. Check it out at Yves Rocher’s store at Westgate #02-16 today. Isn’t it amazing how truffle makes everything instantly taste better? If you can’t get enough of this “black gold”, be sure to head down to District 10. Executive Chef Luca Pezzera has specially created a menu that includes items such as Homemade Angel Hair Pasta with Alba Black Truffle and Parmesan Cheese Sauce, and Black Angus Beef Burger with Alba Black Truffle. Yummy! Available during lunch and dinner at District 10, #01-15/16/17 UE Square until April 18, 2014. For reservations, call 6738 4788. 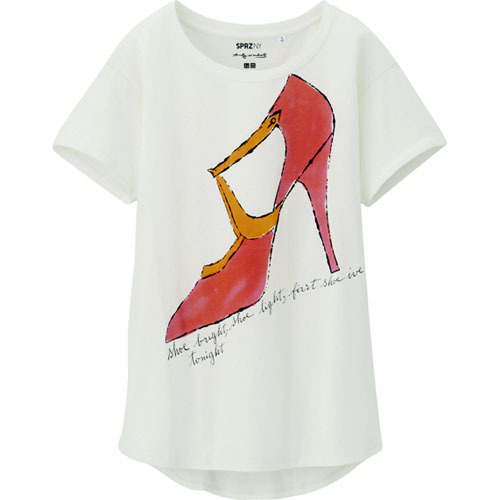 As if we need another reason to love Uniqlo! Everyone’s favourite casual-wear brand has announced an arty-farty tie up with MoMA (that’s the world-renowned Museum of Modern Art) to launch the SPRZ NY (Surprise New York) collection. Now you can wear the works of renowned artists like Andy Warhol, Jackson Pollock, and Ryan McGinness on your sleeve (or tote bag). 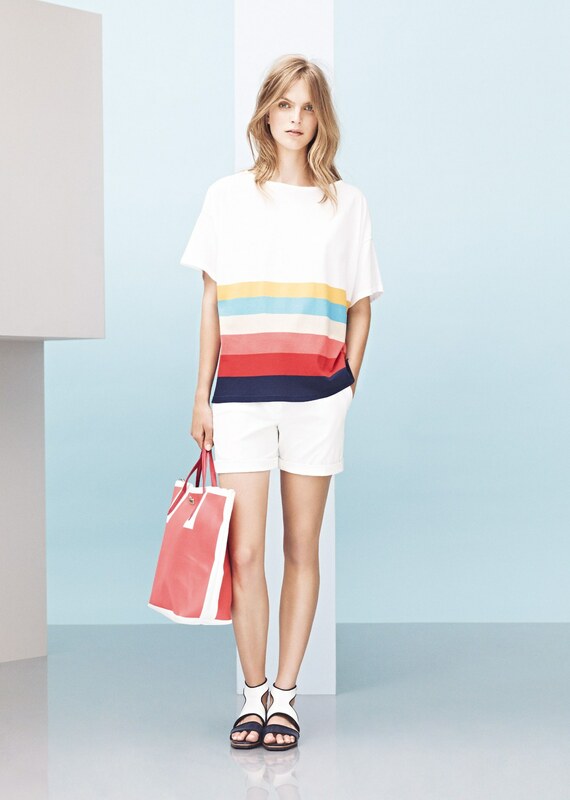 Uniqlo’s SPRZ NY collection is now available at Uniqlo outlets islandwide. When it comes to travel, a bit of forward planning pays off. Book your Club Med holiday from now till April 30, 2014, and you can enjoy up to 40 percent off an all-inclusive package to two snow resorts in Asia – Club Med Sahoro (Hokkaido, Japan) and Yabuli (China). It’s the perfect opportunity to try skiing for the first time! Travel period: December 1, 2014 – April 30, 2015. For more information, visit www.clubmed.com.sg or call 1800 Club Med. We are a demanding bunch. As if portable mobile phone chargers aren’t enough to satisfy today’s generation of on-the-go users, there is a rising demand of wireless chargers. Sony has recently rolled out their first of such a device: Sony CP-W5, a wireless charger that is compatible with Qi-compatible phones (read: not Apple). This inductive charging technology wirelessly charges using an electromagnetic field so you don’t have to carry a micro USB cable wherever you go – though you can also choose to charge it using the cable, if you prefer. When connected to an AC power supply, the CP-W5 serves as a charging plate; place your Qi-compatible device on it and both will be charged at the same time. 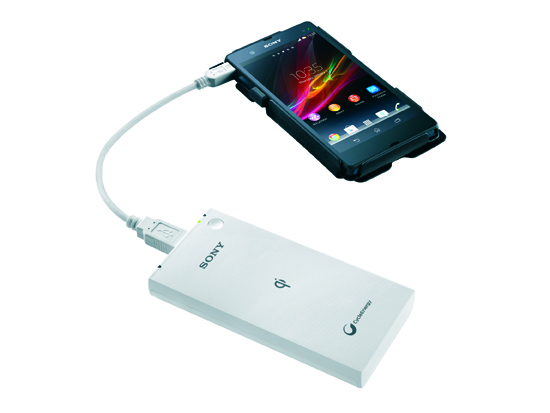 The Sony CP-W5 USB Portable Charger comes in white, and will be available from April 2014. Price unavailable at time of publication. Tickets for Happy Ever Laughter are available at Sistic. Yoga studios are a dime a dozen in Singapore, so when you do decide to commit to one, you’ll want to make sure it is a perfect fit. West-siders, here’s one for you. Meraki Yoga is a new boutique yoga studio located within the lush and quiet One North Residences, and is committed to small-group learning. To celebrate the launch of Meraki, the studio has an ongoing promotion of 40 percent extra classes with any class card package purchased. Zero fighter planes, that is. 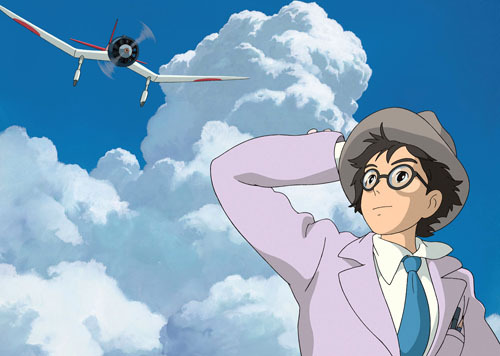 Hayao Miyazaki’s last film “The Wind Rises” tells the tale of real-life aeronautical engineer Jiro Horikoshi, who designed many of the Japanese fighter planes during World War 2, including the Zero fighter. While several people have decried the film as glorifying the horrors of war, it’s really anything but. Instead, “The Wind Rises” is a quietly beautiful film about childhood dreams and a tender, enduring love. Like all Miyazaki films, there’s plenty to take in and think about, and you’ll be rapt from start to end. The Wind Rises is now showing in selected theatres. The festive season is always an exciting period for fans of The Body Shop. It’s when the brand reveals its holiday selection of body products bearing special-edition gourmand scents. 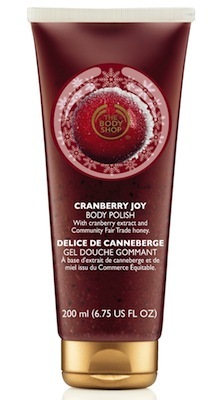 This year, The Body Shop’s Christmas selection has 3 ranges – Cranberry Joy, Ginger Sparkle, and Vanilla Bliss – all aimed at evoking the heart-warming joy and sumptuous treats we have come to associate the holiday season with. Used in recipes such as cranberry sauce to accompany roast turkey or as mincemeat for pies, the tart flavour of cranberry cuts through the richness of butter and gravy, so you can … eat some more! In Cranberry Joy, this mouth-watering fruity fragrance is an instant pick-me-up, best for when you are feeling all hung over from a night of partying. A scrub in the shower first thing in the morning is one of the best ways to get the blood circulation going. The crushed walnut shell provides the gentle exfoliation and massage action to slough away all surface dead skin cells. You’ll feel absolutely renewed after a minute or two of massaging this on your skin! The berry scent is uplifting and you’ll feel instantly happier – it’s like breakfast for your skin! You’ll be glowing with radiance after this! Nothing makes you feel toastier than a gingerbread and, the cheeriest way to eat it would be in the form of a gingerbread man! Ginger is also a traditional home remedy for colds and cramps, added to tea to relieve cold feet and hands. In Ginger Sparkle, The Body Shop has infused this spicy fragrance into its range of body products to add a zing into your bodycare regime. The scent is somewhat reminiscent of gingerbeer – warm, addictive, and definitely fun! I’ve been suffering from the flu for a week now and I am so glad for the Ginger Sparkle Body Butter. The scent is so comforting – it seems to be the only thing I can actually smell. The body butter is made from Community Fair Trade cocoa butter. The gingerbread man on the lid of the tub is such a cheerful addition, it never fails to bring a smile to my face every time I look at it! Although a common flavouring in cookies, cakes, and custards, vanilla is actually the second-most expensive spice after saffron. Its creamy floral bouquet imparts an indulgent flavour to desserts, making them a treat to the tastebuds. 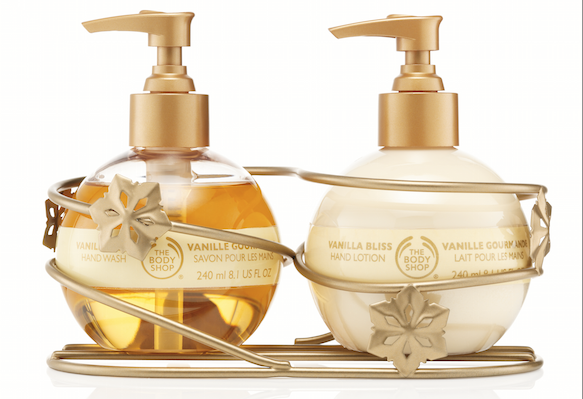 In body products, the vanilla scent has a relaxing and calming effect on the mind, great as a pre-bedtime treat. I’ve always detested the harsh “chemical” smell of hand cleansers but this soap creates a creamy lather and leaves behind a delicate scent. Just the right size for hands too, this is a pretty soap to leave at the sink whenever you have guests over. If you are looking to give your hands more TLC, The Body Shop Vanilla Bliss Hand Cream is a great follow-up. It comes in a handy (pardon the pun) 30ml tube that would fit into your handbag. Besides the body polish, body butter, heart soap and hand cream, each of The Body Shop holiday edition also comes with shower gel, shimmer lotion, lip balm, reed diffuser and home fragrance oil. Gift sets, attractively wrapped, are available too for your shopping convenience. See below for some ideas! Remember, every gift set purchased from The Body Shop this festive season will help towards The Gingerbread School House project. To learn more about this project, click here. 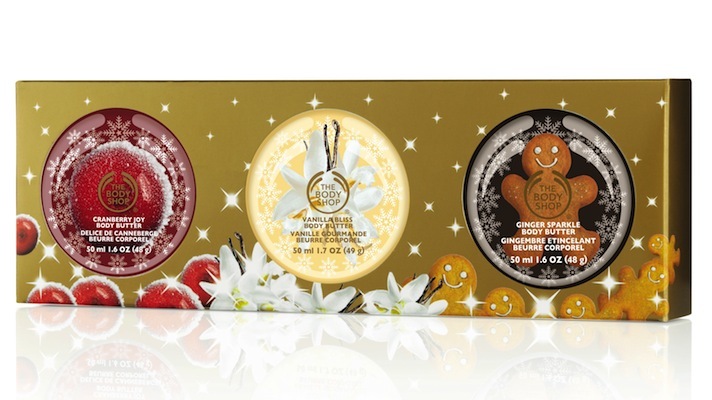 The Body Shop Festive Body Butter Trio, $29.90. For those who want ALL 3 holiday editions in one useful set! The Body Shop GInger Sparkle Shower, Scrub And Moisture Collection, $39.90. Possibly the cutest thing you can get a friend for Christmas! 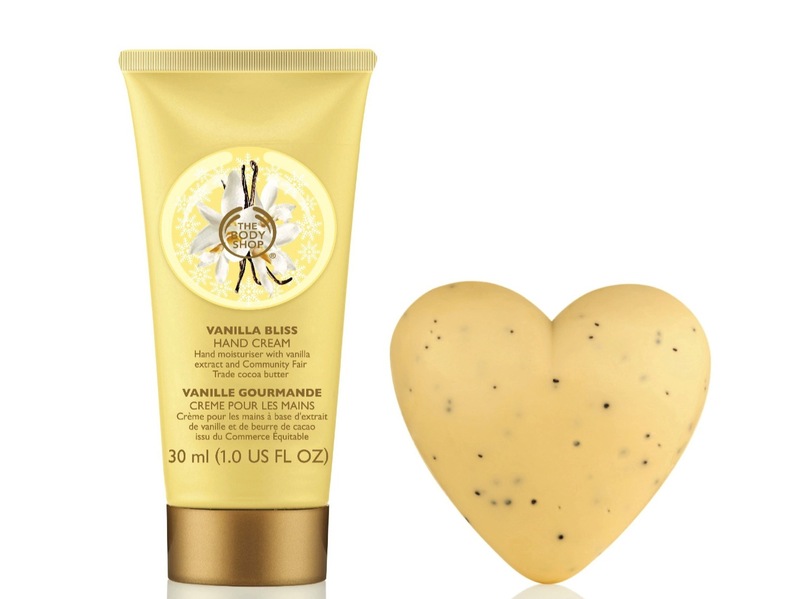 The Body Shop Vanilla Bliss Hand Care Duo, $29.90. The easy-to-use pump bottles are a dream come true! Purchase any of The Body Shop gift sets to contribute towards its Gingerbread School House Project. Check out The Body Shop’s website for a full listing of their stores in Singapore. This post is brought to you by The Body Shop. 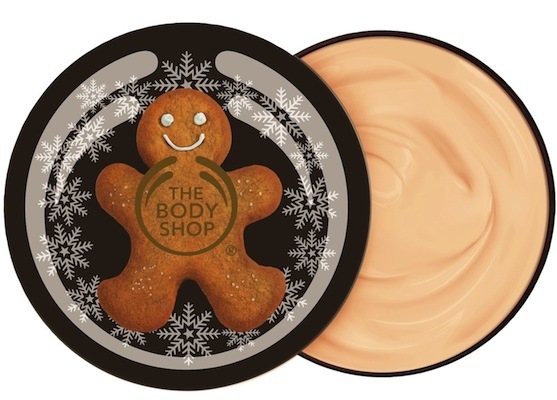 The Body Shop worked with Material World to introduce its 3 holiday editions – Cranberry Joy, Ginger Sparkle, and Vanilla Bliss. All opinions are the author’s own. This post was not vetted by The Body Shop. Read our advertising policy here. If you’ve got nothing planned for the weekend, be sure to make your way to TANGS Orchard for “Beauty Treasures Around The World” by L’Oreal Luxury Brands. Presented to you by brands such as Lancome, Kiehl’s, Biotherm, YSL, Shu Uemura, Giorgio Armani Fragrances, and Clarisonic, this one-of-a-kind beauty event promises to take you on a journey around the world to experience the iconic products of each of the brands mentioned above. To participate, get your hands on a Boarding Pass. The super whimsical boarding pass! 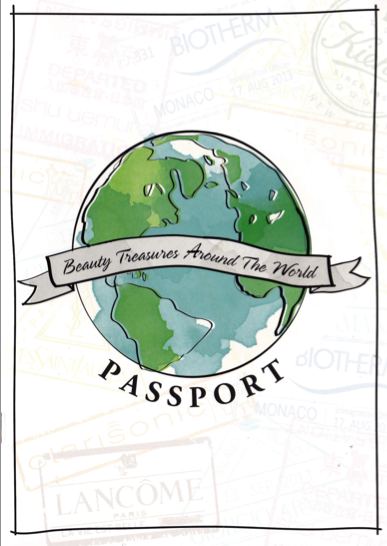 Upon presentation of this boarding pass, you will be given a Beauty Passport. 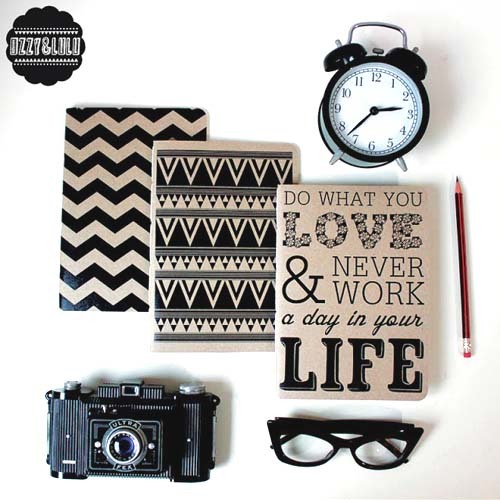 Now, your job is to “travel” to the different “destinations” and collect “passport stamps”. To get a passport stamp from a brand, all you have to do is sign up for the experience at its counter. What are the experiences? Kiehl’s: A 5-minute personalised consultation where you’ll also receive 5 complimentary samples! Yves Saint Laurent: A signature Ritual Lumiere and your sample of the awesome foundation Le Teint Touche Eclat. See the super cute Biotherm “passport stamp”? 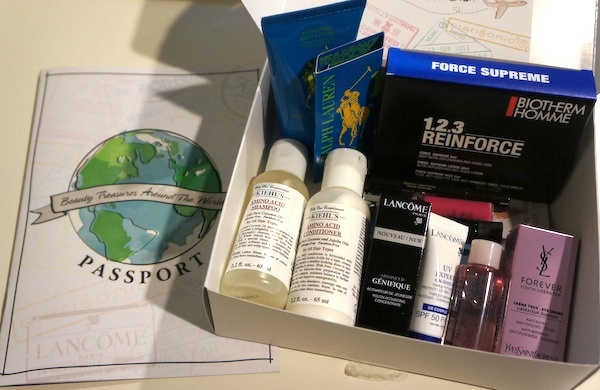 And the best part for all beauty junkies out there who refuse to travel out of the country without a decent stash of products for your skin, hair and body, once you get 4 stamps in your Passport, you get to buy a Beauty Box filled to the brim with goodies from the 7 brands for just $20!!!!!! The stuff every jetsetting beauty junkie needs for just $20! These 7 brands will be extending a 10% discount off all their products at TANGS Orchard and Vivocity! Start your Christmas shopping now so you can enjoy insane savings WHILE making sure your loved ones get the best presents money can afford. There are more great prizes and gifts awaiting you at TANGS Orchard so be sure you get ready for the beauty journey of a lifetime today. This event ends October 31, 2013, so don’t miss it! Fun trivia! The writers behind the Beauty Passport are none other than Material World’s founders Deborah and Denise. This passport also contains cool ideas on what to do and where to go if you should ever travel to the brand’s city of origins. So be sure you don’t leave TANGS Orchard without grabbing a copy of the Beauty Passport! 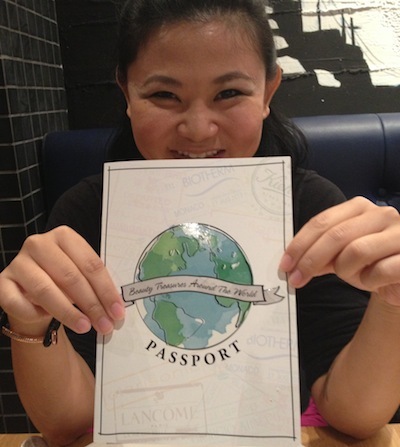 Denise and I wrote the copy for this passport! About The Author: Deborah Tan is a founder of Material World. After 10 years of working in magazines Cleo and Cosmopolitan Singapore, she is now a freelance writer/editor who works on this website full-time. She likes liquid eyeliners, bright red lipsticks, tattoos, rock & roll, Mad Men, Suits and needs the new grey Clarisonic Mia2 for Christmas. Follow her on Twitter @DebTanTweets. After a long week at work, you deserve a little weekend pampering. Good food and music plus some retail therapy … that will chase the Monday blues away for sure. 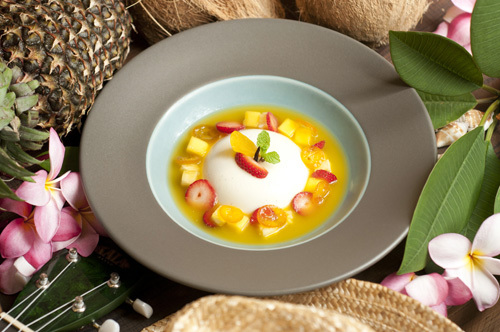 For starters, check out the Hawaiian Festival at Shangri-La’s The Waterfall. The wide variety of Polynesian dishes and Hawaiian live entertainment combined with the cafe’s lush, tropical surroundings will make you feel as if you’ve teleported to the Aloha State. Some of the mouthwatering dishes you can look forward to include Steamed Lomi Salmon Rice Ball with Hibiscus Ume Ankake, Coconut Butter Poached Lobster with Galangal and Kaffir Lime as well as Sour Crispy Pork Belly with Pineapple Gastrique and Parmesan Seared Scallops with Truffle-Flavoured Edamame Puree. 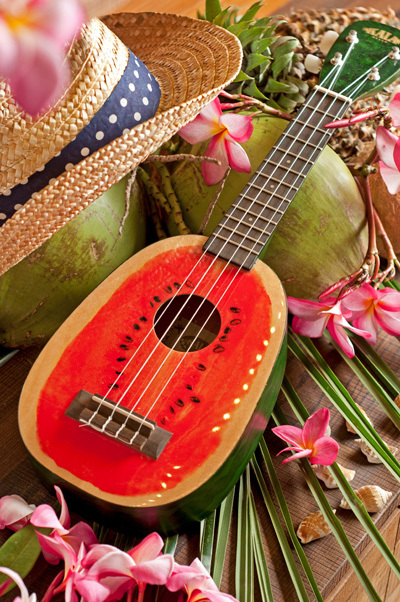 As you tuck into these exotic treats, unwind to the music of Grammy-nominated Hawaiian musician Jeff Peterson, who will be accompanied by two native hula dancers. “Aloha Hawaii” is ongoing at The Waterfall from today till 29 September. For reservations and enquiries, please call 6213 4398 or e-mail dining.sls@shangri-la.com. After a satisfying meal, it’s time to go SHOPPING! For the first time ever, luxury lifestyle brands Reebonz, Reebonz Vintage and Kwerkee have banded together to bring you a shopping carnival unlike any other. Occupying two entire levels of the cavernous Marina Bay Cruise Centre, you can expect exciting brands like Commes Des Garcons, Cath Kidston, Salut De Miel and many more. Even better, you can also get your hands on all your favourite designer brands like Prada, Miu Miu and Balenciaga at clearance prices! 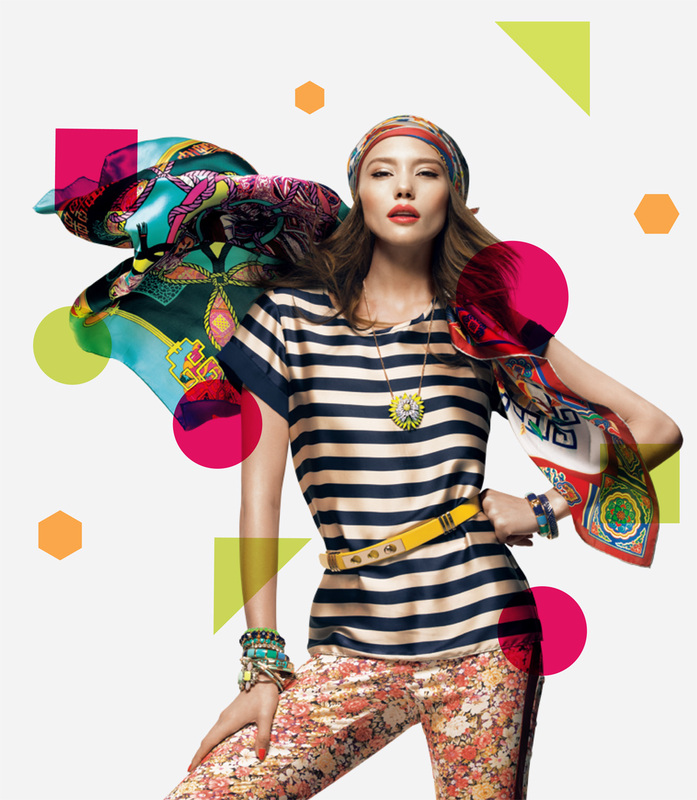 Reebonz Fashion Fest 2013 and Kwerkee Pop-Up Karnival is ongoing from today till 29 September at Marina Bay Cruise Centre, 61 Marina Coastal Drive, Singapore 018947. About The Author: Vanessa Tai is a founder of Material World who has previously worked on magazines Simply Her and Cosmopolitan Singapore. Now a freelance writer and a full-time contributor to this website, the 26-year-old dreams of attending every single major music festival before she turns 30. Follow her on Twitter @VannTaiTweets. Let’s face it, sometimes the retail offerings at malls can get a little boring and while online shopping is great, there’s the whole waiting around for your package to contend with. Which is why I love a good flea market – you get to discover lesser-known brands and more often than not, it’s way more affordable than regular shops. Every Little Thing – which focuses on apparel and accessories – is an offshoot of Public Garden, a flea market operator that specialises in local indie labels. Are you a loud and proud shoe addict? 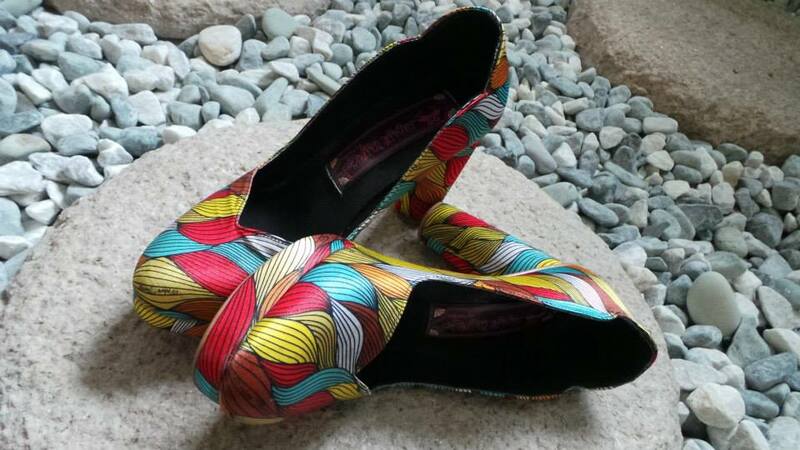 Then you’ll love the cheerful colours and bright patterns of Cloudberry Circus’ footwear. Priding themselves on only stocking one piece per design, this unisex vintage label will be launching a range of vintage Hawaiian shirts at this weekend’s flea. This local accessories maker has amassed quite a following with her whimsical designs that feature clouds, odd-sized flowers and even pink zebras! Why splurge on brand-name stationery when you can get lovingly handmade paper goods and stationery from Ozzy & Lulu? 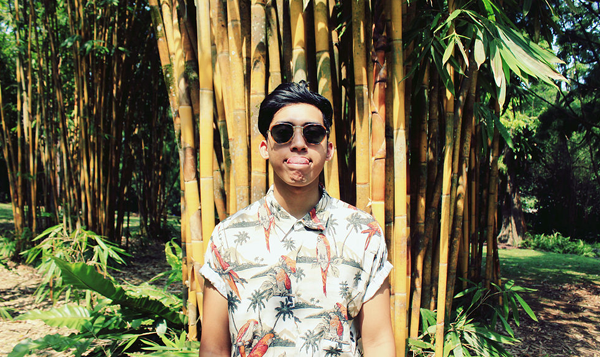 Vintage continue to live on through the elegant designs of You Klub Kid. This flea sees the stallholders bringing in a collection of gorgeous ’70s inspired dresses. Every Little Thing will be held on 13 and 14 July, from 1pm to 7pm at City Square Mall Fountain Square, Basement 1. For more information, click here. Before my own experience with one I thought only celebs and A-listers enlisted the help of personal shoppers. I mean, who else can fork out money for such a service?! Well, you’ll be glad to know that Singapore’s very own Topshop at Knightsbridge offers personal shopping … completely free of charge! I met Topshop personal shopper Melanie by chance. 987FM presenter Rozz introduced us at the launch of Face Hunter’s new book awhile ago and, I thought it would be a good chance for me to experience personal shopping for myself. I was also hoping that she could get me out of my style rut; I’m a dress girl and my wardrobe is bursting with tailored-fit dresses, shift dresses, skater-cut dresses, midi-length dresses … I live by the philosophy that I shouldn’t take more than five minutes getting dressed each morning which was why I’d always stayed away from separates. The last thing I need is to deal with the extremely brain-draining activity that is mixing and matching even before my first cup of coffee. It’s the same reason why I don’t accessorise. Lately, I’ve been feeling quite bored of my “safe” style. You’d think my previous job as the Features Editor of an international women’s title would have exposed me to fashion’s endless possibilities. Colour me clueless cos I didn’t even have a clue as to how to go about changing it up! The picture below shows what I’m typically dressed in … I usually pair my dresses with boots or high-cut sneakers, because I don’t think one should needlessly suffer in the name of fashion. But that’s my problem. I don’t consider myself conventional or conservative and yet, where fashion is concerned, I seem to have restricted myself with all these rigid self-made rules! Would a personal shopper be just the guide I need to navigate the vast and scary wilderness that is fashion? I was about to find out. Before I met Melanie for my personal shopping session, I was given a form to fill out. Besides my sizes, I had to list down stuff such as my celeb style icon, favourite brands and styles of clothing. This is to help rule out any styles or cuts that I wasn’t partial to. But since the whole point of this exercise was for me to try out things I’d never pick out of the rack myself, I deliberately left a lot of the sections blank. I headed to the basement of Topshop Knightsbridge on the day of my appointment. The store has a section specially cordoned off for personal shopping. I was greeted by the chirpy Melanie, as well as a couple of racks of clothing that she’d picked out for me prior to the session. But enough talking for now … let’s see the fruit of Melanie’s labour. I like this simple sweater-and-denim shorts combo that channels that “festival vibe”. Pretty sure I saw a picture of Chloe Sevigny wearing something similar at the recent Coachella festival. I was a little hesitant when I saw the number of sweaters on the rack. Who in their right mind would wear such a thing in our insanely hot weather?! But my disinclination to pick out anything that would allow me to stay cool and comfortable in the tropics is probably why I find myself decked out in very uncool puffy sports jackets or non-insulating denim jackets when I visit temperate countries. … this mesh skirt! An offbeat combo I can definitely see myself wearing more than once in awhile, though I’d probably match the ensemble with my favourite black boots instead of sandals. Wow, I thought this ensemble would come off looking all sorts of wrong on me but it’s actually pretty cute. The collar and the skirt give the ensemble a schoolgirl charm, though a braver soul would wear only a bra or bralet inside instead of a camisole. To toughen the look, simply add black boots. Okay, I must admit I was thisclose to declining trying on this jumpsuit. Remember my obsession with the functionality of clothing? A onesie that involves unzipping and pulling down the whole damn thing before you can use the toilet definitely does not quality as “functional”. But once it was on, I was amazed. I love the print and that it fitted so well; it was as though a tailor took my measurements and made it specially for me. What sold me on this completely was that the waistband was at a perfect height to my body. If it’s too high, it’ll make your upper torso look short. Too low and it’d simply be unflattering for the lower half of your body. This one cinched in perfect even without the belt. As testament to Melanie’s styling powers, I walked away from the store that day with two items of clothing I’d never have otherwise picked off the rack, much less buy: the statement-making tiger sweater and the gorgeous onesie. Melanie certainly has a fashion editor’s sensibility when it comes to styling. Almost every look she creates looks effortlessly pulled together, thanks to her eye for detail and an uncanny ability to know instinctively what would work for you. 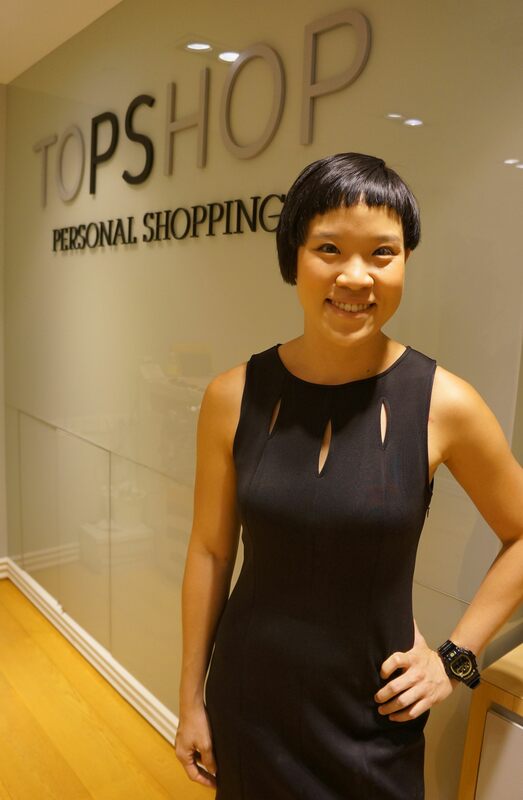 Over to her tell you more about the personal shopping experience at Topshop! Which Topshop outlets in Singapore offer this service? The outlets at Knightsbridge, ION Orchard and Vivocity. I’m based in Knightsbridge and my colleague Anny, in ION Orchard. But should the client prefer to have the appointment at Vivocity, it’s not a problem for either of us to make our way there too. How far in advance should a client make an appointment with you? It is best if clients make the appointment at least three days to a week in advance so we can prep beforehand. If the client is looking for something in particular – a dress for a wedding lunch, for instance – and we don’t happen to have many options on hand, it gives us more time to keep a lookout as we have shipments coming in twice a week. Tell us about your clientele. I have clients from all walks of life, ranging from the ages of 13 to 70. (Yes, one of my clients is a very youthful-looking and happening 70-year-old!) There are bankers, lawyers, homemakers, students and more that use this service. Some need styling advice for a special occasion, while others just want fresh ideas on how to mix and match separates. We can tailor-make the appointment to suit each client’s needs. Any memorable experiences in your time as a personal shopper? My most memorable experience was when a group of friends made a surprise appointment for their good friend as one of the pitstops for her hen’s night. The bride-to-be was blindfolded till she arrived and had no idea her friends had arranged the shopping spree as a gift to her. She came with a life-sized groom helium balloon. It was a very fun session for both the clients and us! How would you define your own style? We love that it’s eclectic and one-of-a-kind! I find myself at a loss of words whenever I’m asked this question. Haha! I dress according to my mood each day. I can be quirky one day, and edgy the next. Preppy today, festival-ready tomorrow. I have no one style or look. I like trying new things and exploring possibilities. The personal shopper service at Topshop is free of charge. To book an appointment, call 6733 4608 or email booking.ps@topshop.com.sg. Special thanks to Deborah for taking all the pictures you see in this post. Topshop did not pay for this review. All opinions expressed at the author’s own. Don’t hit the shops and counters before you had a read of this week’s Beauty Matters. 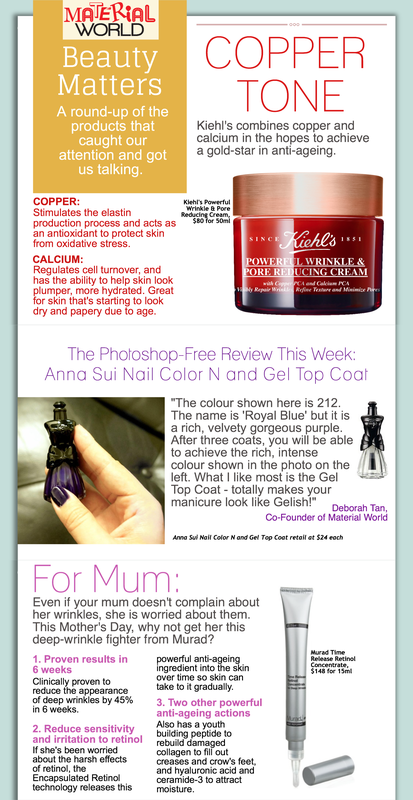 This week, we talk about an anti-ageing cream from Kiehl’s , Anna Sui’s easy-to-apply nail varnish and gel top coat, and the perfect Mother’s Day gift from Murad. Wisma Atria and I go a long way back. Back in junior college, it used to be the first stop my classmates and I made after school, and I have fond memories of patronising The Coffee Bean and Tea Leaf (back when Ice Blended drinks were new and novel). We also used to frequent this bubble tea joint called Tea Shake Hut (does anyone else remember it?!). That was way before bubble tea joints started mushrooming in every corner. I can still remember the thick, milky sweetness of its Honeydew Milk Tea; no other bubble tea joint has since been able to successfully replicate it, I swear. I also remember going window-shopping at Project Shop Blood Brothers at Wisma Atria. That was when their simply-designed black totes were carried by anyone who was considered cool and trendy and I remember thinking to myself, “As soon as I save $100, I’m going to buy a Project Shop bag.” Well, that never happened (most likely because I had moved on to some other fleeting trend by then). And Tea Shake Hut is no longer at Wisma Atria (probably because they could not sustain selling their bubble teas at $4.50 each, when so many other shops were pricing theirs at below $3). But I’ve always liked Wisma Atria because of its well-edited list of shops. High street brands such as Miss Selfridge, Dorothy Perkins and Forever New are represented, and so are shoe brands such as Pedro and Nine West. 2013 will see the mall add four brands to its existing stable of shops. They are Hong Kong avant-garde multi-label fashion house i.t, Italian fashion brand Liu.Jo, French lingerie brand at Etam, as well as Lacoste (the largest concept store in Singapore). Here’s a sneak peek of what’s to come. It’s a multi-label store, and its in-house brand is known as “izzue”. So far, loving what I’m seeing of its Spring/Summer collection – the mixing of different fabrics and edgy details! And with prices starting at $69 for a top, shopping here won’t break the bank. The Italian brand has a good mix of casual chic pieces, as well as party-perfect ensembles. It’s definitely the place to go if you’re looking to add a dash of sophistication to your weekend look. I have friends who stock up on Etam lingerie whenever they head to Europe. I’ve had a look at the brand’s international website and I’m glad to report that the brand’s designs look tasteful, chic and practical. One of my favourite stores to head to for quality casual pieces that really last. About the Author: Denise Li is a founder of Material World and a freelance writer-editor. Before that, she spent a few years in the Features section of CLEO and Cosmopolitan Singapore. She considers Chiang Mai her spiritual home and makes it a point to head there for a yearly pilgrimage. She’s also a fitness buff and enjoys boxing, running and the occasional yoga session. Lastly, she believes that everyone should make it a point to travel solo at least once in their lives.